Collisions of lead nuclei in the Large Hadron Collider (LHC) take place at such great energies that quarks that are normally confined inside nucleons are released and, together with the gluons that hold them together, form an exotic quark-gluon plasma. A new, more detailed theoretical model for this plasma, presented by a group of physicists from Poland and the U.S., predicts that it has a much lower viscosity than previously estimated. Our everyday world consists mainly of protons and neutrons, each containing three quarks held together by strong interactions conveyed by carriers called gluons. In contrast to gravity, which acts more weakly at a distance, strong interactions of quarks increase with greater distance. Quarks behave as if they were connected with springs—the farther you separate them, the harder they try to remain connected. However, the energies of particles accelerated inside the LHC are so high that, during collisions, quarks are released from protons. 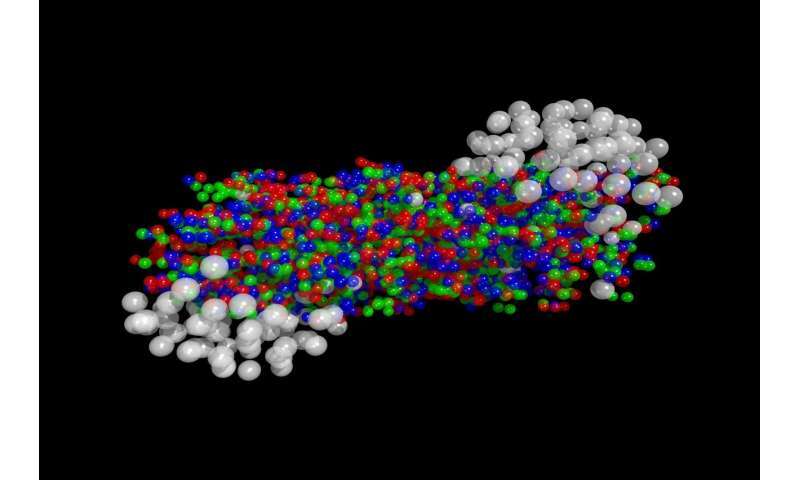 Quark-gluon plasma is produced for a short time—the most exotic fluid ever examined in laboratories. Until recently, physicists believed that it was quite viscous. A different conclusion has emerged from analyses by researchers from the Institute of Nuclear Physics Polish Academy of Sciences (IFJ PAN) in Cracow and Kent State University in Kent (Ohio, USA). "In physics, flows are described using hydrodynamic equations. When applying the simplest versions of these to quark-gluon plasma evolution, the predictions are quite consistent with LHC collision measurements. At first glance, the quark and gluon soup really does seem to behave according to simple expectations. However, when we start to look closely, it rapidly becomes evident that we are dealing with a very complex phenomenon," says Dr. Radoslaw Ryblewski (IFJ PAN). The mathematical description of fluid assumes that the fluid is perfect, i.e. devoid of viscosity. Since there are no perfect fluids in nature, various corrections are introduced to improve the accuracy of hydrodynamic equations. However, the resulting variants of viscous fluid hydrodynamics are based on further assumptions—for example, that pressures in fluid change the same way in all directions. "The problem is that quark-gluon plasma in the LHC is produced in a very specific way, as a result of collisions of lead nuclei approaching along one direction at velocities close to the speed of light. As a result, the fluid formed by quarks and gluons initially moves along the direction of the beam, and only then does it begin to cool down and dilute in all directions," explains Dr. Ryblewski. "When creating a model, the scale of the challenge increases even more when we try to take into account the fact that at the beginning of the process, the fluid is different than at the end—since after cooling, the quarks gradually begin to stick together again. So, together with Prof. Wojciech Florkowski, we began to develop a more detailed model of the phenomenon: anisotropic hydrodynamics, built on the assumption that the system does not behave in the same manner in all directions." The latest theoretical model, constructed on the basis of anisotropic hydrodynamics, has just been presented in Physical Review Letters. One of its most interesting conclusions concerns the viscosity of quark-gluon plasma. This viscosity turns out to be six times less than the numerical predictions of other models based on the hydrodynamics of viscous fluid. In contrast to the previous equations, in certain cases, the new ones can be solved with practically any level of accuracy. By combining their predictions with data from other models and repeatedly comparing them with actual measurements in the ALICE experiment at the LHC, the Polish-American team has demonstrated that anisotropic hydrodynamics is currently the most accurate description of the phenomena occurring in quark-gluon plasma.